The High Court has approved a €10m lump sum payment for an 11-year-old girl who sued the Health Service Executive over the circumstances of her birth. It brings to €12.2m the total paid to Rachel Gallagher of Straide, Foxford, Co Mayo who has cerebral palsy as a result of a brain injury at birth at Mayo General Hospital. Her lawyers told the High Court that Rachel's parents were accepting the settlement because they wanted an end to the legal process. He said the family, and Rachel herself, found the ongoing process very difficult, as she has to undergo medical examinations and assessments before court appearances. President of the High Court Mr Justice Peter Kelly said this would have been Rachel's third time in court. Before coming to court each time she had to go through "a battery of tests and assessments" and this created a lot of stress for herself and her family. He said he had a great deal of sympathy for the Gallaghers and had seen many families in other cases that did want another interim payment, but also wanted a final lump sum payment. He said Rachel, who has made the best of the situation, was a great example of the heroism of those with this condition. In court, Rachel asked to speak to the judge and said "thank you, your honour," when the settlement was approved. Mr Justice Kelly said very few judges are thanked and he was very grateful to Rachel. He said it was a good settlement, which will provide for the care she will need for the rest of her life. Rachel had sued through her mother Ciara Hynes over the circumstances of her birth at Mayo General Hospital on 28 September 2006. Ms Hynes was admitted to Mayo General Hospital on 27 September and the next morning they started to induce the birth and syntocinon was commenced after midday. Rachel was born in poor condition at 6.22pm. It was claimed there was a failure to properly manage and monitor the labour, delivery and birth of the baby. The court heard negligence was admitted in the case. 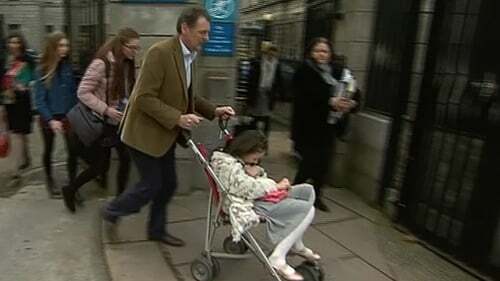 Senior Counsel Denis McCullough told the court that Rachel needs one-to-one care because she is at risk of falling. Counsel said she is in fifth class at school and it is hoped she will go on to secondary school and university. Counsel said €10m was reasonable and her parents are satisfied it is a fair and reasonable figure. Ms Hynes told the court that in an ideal world they would maximise the damages for their daughter, but she said it was not an ideal world and they were satisfied with the settlement.